Erg Chebbi Merzouga is one of Morocco’s two Saharan ergs, vast color seas of dunes formed by wind-blown sand. 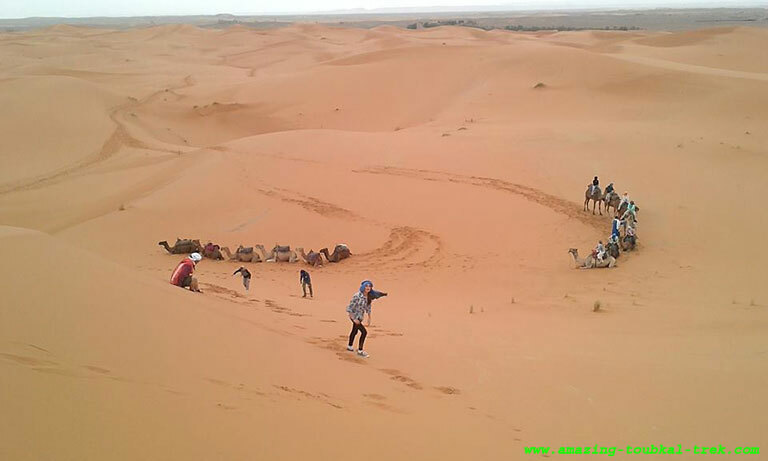 About 50km south of Arfoud is the tiny village of Merzouga and nearby the famous Erg Chebbi dunes. Morocco’sonly genuine Saharan erg-one of those vast, drifting expanses of dunes that typify much of the Algerian Sahara. We offer the desert trip from Marrakech to Erg Chebbi. It’s a magical landscape, which deserves much more than just a sunrise glimpse. The dunes themselves are fascinating, chacolorfrom pink to gold to red at different times of the day. The Sahara desert is a great place to appreciate the immense, clear desert sky. For bird-watchers, this is the best area in Morocco for spotting many desert species, including desert sparrows, Egyptian Nightjars, desert warblers, fulvous babblers and blue-cheeked bee-eaters. Sometimes in spring (dependent on rainfall), a shallow lake appears northwest of Merzouga, near the Auberge Yasmina, attracting flocks of pink flamingos and other water birds.